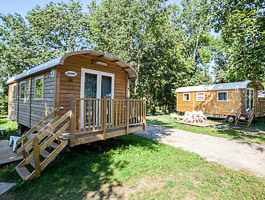 Located in the heart of the lake district of the Jura along the Ain river, near the Lac de Vouglans, Camping les Pecheurs offers an outstanding setting for nature lovers. Discover this calm and pleasant family campsite in the center of the little village of Pont de Poitte. Visit the beautiful and various nature, the culturel heritage and tradecraft of the Jura. New 2019 - Mobil Home "Declik"
500m from our campsite ! Mentions légales Réalisation Koredge Follow us on Facebook !